This Paper provides brief introduction to the Forest and Community Forest in Nepal and context and status of community forest in Nepal. Community forests in Nepal are built on the experience of other countries around the world, especially its neighbors in South Asia. In order to understand the context and particular designs and objectives of Nepal’s community forestry program, key literature on community forestry is summarized. Particular attention is paid to the evolution of community forestry in Nepal from first protecting local forests and forest products for subsistence needs, to an increased role in income generation and meeting national development goals, including poverty alleviation. Binod, Bhattarai. "Community Forest and Forest Management in Nepal." American Journal of Environmental Protection 4.3 (2016): 79-91. Binod, B. (2016). Community Forest and Forest Management in Nepal. American Journal of Environmental Protection, 4(3), 79-91. Binod, Bhattarai. "Community Forest and Forest Management in Nepal." American Journal of Environmental Protection 4, no. 3 (2016): 79-91. FAO (1978) defines community forestry as “a situation, which intimately involves local people in forestry activity” . This definition includes a wide spectrum of activity such as allowing local communities to completely manage their forest for local needs; giving them access to the economic benefits derived from forest, and protecting forests maintains ecological wellbeing along with generating income for rural communities from the processing of forest products. Community forestry generally involves three major activities. First is local decision making and controlling an area of forest land, second is local control of benefits, including revenue and forest products and third is increasing local value-added manufacturing with maintenance of long term ecological integrity of the forest ecosystem . “Hariyo Ban Nepal Ko Dhan (Green Forests are the wealth of Nepal)” has been a very popular slogan in Nepal and to some extent a reality as well. However, with the nationalization of forests by the government in 1957, the local people who had been using the forest resources as well as protecting the forests were deprived of their rights. The nationalization of forests by the government has let to mistrust among the people towards the efforts made by the government for the forest protection. To add woe to this, the increasing population was bound to depend on the adjacent forests for meeting their basic needs such as firewood, fuel, fodder and timber . As a result of this, the forests were exploited in manners that were not conducive to sustainable management practices. Consequently this led to deterioration of forests particularly in the hills in the form of accelerated forest encroachment, illegal logging and continued deforestation. To stop the rapid decline and deterioration of forest conditions, the government initiated the community forestry program. The community forestry program was specifically brought in with an objective of meeting the subsistence needs of local people and at the same time for protecting the forests by transferring user rights of forest resources to the local users . In community forests, parts of government forests are handed over to a group of local households known as Community Forest User Groups (CFUG). They prepare a forest management plan according to their needs and forests are managed according to the plan for the purpose of resource utilization as well as protection and conservation. The basic assumption of the CFUG is that users become united and become capable of managing community forests for their mutual benefits. However, requirement and interests of the households participating in community forests is different depending upon their economic status. Poor people want to use it more for subsistence such as fodder, food and firewood while rich people are more interested in its commercial value such as timber. The need for a community forestry program in Nepal was first emphasized by government policies as early as 1976 (By the National Forest Plan, 1976). This resulted in amendment of the conventional Forest Act (amendment 1977) by making provisions for handing over of part of government forests to the smallest local governance unit, then known as “Panchyat” (HMG, 1978). It further produced regulations called Forest Rules, in 1978 for smooth implementation of the program. The local panchayats had ownership over plantation forests (Panchyat Forest) and existing natural forests (Panchyat Protected Forests). But it was the local households, who had to be involved to protect the forest, contribute their labor for forest management activities and very often had to sacrifice their traditional use of forests, such as grazing, in the name of community forest development. Therefore, there was no feeling of ownership among the local people. Thus, local a panchayat was not able to motivate local communities sufficiently for forest management. However, in terms of policy formulation, this program is considered as one of the best forestry programs in the world . After the panchayat system was overthrown, political instability was created. In the absence of proper legislative structure, forest administration started handing over the forests directly to the local groups involved in protecting forests. Providing ownership of forest management directly to the local forest users made the community forestry program more acceptable, and users started contributing for forest protection and forest management, such as thinning, pruning, weeding, etc. Thus, local communities started to have more responsibility in forest management and they started to get benefits from forest products such as tree fodder, grass, poles and firewood. A master plan of the forestry sector (1989) placed the community forestry program as one of its six primary programs. The Forest Act was enacted in 1993, where community forestry was recognized as one of the forestry programs for Nepal. Regulations were passed in 1995, which elaborated operational modalities for community forests. The regulations allowed local people to manage the forests and to use the forest products according to the management plan approved by the District Forest Office (DFO). After enactment of new Act and Regulation, implementation of the community forestry program in the hills went in to high speed. The government announced the handing over of all accessible forests as community forests. All development partners operating in Nepal supported this idea and started formulating and implementing community forestry programs. By 1995, the number of community forestry and its related programs or projects across Nepal reached 13 (MFSC, 1996). In the beginning, handing over of good forests to the community was limited because DFO (District Forest Office) kept ownership of good forests. The data in the table shows that the average formation of CFUGs per year is 200 and area added per year is 2,200 ha. Forests are directly related with the nation’s development. It plays a crucial role for the living standard of people. By knowing this fact, since the beginning of civilization, different efforts have been made for its protection, but in the Nepalese context efforts made by the government can be summarized in the following chronological way. In Nepal, the government earned revenue of US$ 1.11 million from the sale of non-wood forest products or almost 18% of the total revenue of the forest sector in 2002 . Ninety percent of rural household income is contributed thought non-wood forest production Non-Wood Forest products (NWFP) related economic activities . In Nepal management of NWFP is done by community forest user groups (CFUG) and national policy explicitly recognizes commercial role . After more than five years of established community forests in Nepal, the collection of forest products including fodder, grass, thatching materials and leaf litter, has increased while fuel wood collection and livestock number decreased. This has led to tree regeneration and improvement of forest health . In addition, the number of community forests in Nepal is increasing: as of 2006 14,258 CFUGs has been formed covering two-fifths of the total population and one-fifth of the total forest area . Studies suggest that the community forest program has had tremendously positive effects on local resource conservation and livelihood conditions . These studies also suggest that the program has improved other areas of natural resources management including watershed conservation and protected area management . A number of small kingdoms and tribal areas had existed in Nepal before unification. Nepal has been predominantly an agricultural country with a land tenure system. Access to agriculture was important to all level or categories of people in society. Stiller (1975) has described the land tenure system in detail. The history of forest management in Nepal is close linked with the political history of the country. In earlier periods, the ruler of Nepal has used forest as a potential source of the revenue and had shown little intrest of forest management. Land use policy in the mountains was designed to encourage the conversion of forest land of the farmland in order to increase the tax base . The forest management situation in the the following period was influenced by political events. The conversion of forest land to agriculture had started before the Prithivi Narayan Shah (Regime 1763). Reclamation of the forest was generally open to anyone who undertook to bring it under cultivation. Tax exemption, normally for three years, was granted in respect of such land, a concession attributed by tradition to King Ram Shah of Gorakha (1606-1633) . The Zamindars and other revenue functionaries, over and above jagir land grant received for their work, were also entitled to reclaim as much new land as they liked without payment of any additional tax . The Gurkha ruler, Ram Shah, established a form of family rule over Gorkha . The land tenure system was established in this area and land tax was levied known as raikar. The peasants paid tax to the state crown as a rent or tax equivalent to one half of product of the land they held. Peasant rights to the land were based on the regular payment of this rent to the crown representative and other revenue functionaries. At that time, land was not allowed to remain as unproductive. In a jagir and birta grants, the land was assigned to a person who served the court in some official, civil or military capacity, even the low ranked staff were able to receive benefits from this land. This form of grant remained valid only if the official concerned continued to serve the state or unite the land was recalled or confiscated Kipat is another and entirely different concept of land tenure existing largely in Buddhist or tribal communities in the hill of Nepal in the Gorkhali period . In many villages such as Rai and Limbu they retained communal land for many years thought the kipat system of tenure, under which natural resources of land and forest were controlled by a village head and distributed in accordance with family requirements. Communal ownership provided checks: and balances to prevent over-harvesting by legal means. In the similar manner, in the Gurung and Magar villages, these groups of people commonly managed their forest using a traditional system that was exercised thought a council of village leader- Mukhiya. In the local system of authority, village heads were powerful about village activities, including forest and pasture. It seems that even before 1743, the former rulers of many autonomous states utilized natural resources for the principle source of income as a family heritage. In the name of state income generation, most of the land had been converted into agricultural land for revenue collection. In 1969, the greater part of present-day Nepal was united into one nation by the King of Gorkha, Prithivi Narayan Shah. After the P.N. shah regime, his descendants continued the task of unification and, by 1808, the frontier of Nepal extended 2,100 km from the Tistha River in the East. At that time, the political situation in India was different and the British were spreading their political control over the Gangetic Plan by subjugating the native Indian rulers. In the Tarai, confrontation occurred between Birtish Indian and Nepal forces. British demanded for evacuation of the Tarai territory were unacceptable to Gorkhali Government. The result was the British-Nepal war (1814-1816) ant the Treaty of Sugauli gave the Birtish East India Company highly important advantages. A large portion of Nepalese territory was surrendered to the Birtish but the part of this was subsequently restored to Nepal in 1861 and 1960 . After 1950, there was rapid political changes made in the previous King’s leadership. The forest was used to secure votes by different level of politicians mostly during the election period. Each elected Government even became unable to solve the forest land encroachment by the migrants in the Tarai. The Government and authorized individuals have exploited nature forest resources for their personal benefit for generations. Forest land was distributed to kin and powerful people by introducing a different tenure system. In the later stage of the Ran regime, one third of state-owned forest was transferred as a birta and kipat and therefore belonged to Rana family. In 1957, the government enforces the Nationalization Act and nationalized privately owned forests. Many scholars suggest the deforestation in Nepal can be traced to the nationalization of communal forest lands in 1950s by the government, thereby alienating local people from their ancestral institution and controls . In fact entitlement of forest was not communal it was with landowners and they allowed local people for forest products use. Local control over forest remained in places where strong local leadership had excluded Government interference. In these areas, forests were protected thought local action to ensure that local people could continue to meet their needs from the forest, and the Act appears to have had little effect . Despite the argument made by Rhodes, there is not any evidence that shows Government has nationalized communal forest. Most of the forest was under the control of powerful people as private forest, which was national property previously. Even powerful people owned these forests as birta, kipat and other means. Forest was permitted to use to local people as mercy of landlord, and there was system providing gift and labor donation instead of taking forest products. The main intention of this Act was to size the power and control of limited elite Zamindars, bringing all the forest under Government control with a view to preserving this natural resource, providing for the protection of forest, and controlling use by the people. The 1957 nationalization Act states the “….. forest constitutes an important part of the national wealth and to protect national wealth… management utilization thereof for the public interest it is expedient to nationalist private forests” (Private Forest Nationalization Act, 1957). There was a provision in this Act that about the limited area of private forest for the individual family, which could not be nationalized. After the end of the Rana era, the government had nationalized private forest in a weak organizational structure and was unable to communicate that view of nationalization to people. Local elite and landlord Zamindar distorted the message of the nationalization Act which accelerated deforestation. Presently, nationalization of private forest has provided an opportunity for increasing community forest in the country, since all the accessible forest under control of Zimindars has been now converted to community forest. The forest Act 1961 was mainly concerned with forest administration. It defined the categories of forest and covered legal procedures for handling different types of forests, which included the duties of the Forest Department (DOF), forest offences and prescribed penalties. This Act also made provision for private forest plots (ban batika), not exceeding in area of 1.25 hectares in the Hill and 3,25 hectares in Tarai, if the individuals planted and grew trees with their own resources and efforts. However, there was a little provision for transferring Government forest land to Panchayat community forest for their use and it remained inactive. In 1962, King Mahendra instituted the Panachyat Policy, which was a new national political system, based on local people’s committees called Panchayats that would build “democracy from the grass roots” . The main focus of the Forest Protection Special Act 1967 (special arrangement) was to further define forest offences and prescribe penalties for these, as well as forest protection. A special court was established under the provisions. This Act provided more power to the District Forest Office in conserving forest resources and policing functions in practice. However, it was only applied in the weaker sections of society, which was brought under the purview of this law enforcement actively. The powerful individuals, who were involved in offences, often escaped thought influence and manipulation. So this Act also proved to be of limited use and the DOF became unable to manage forest resources effectively. 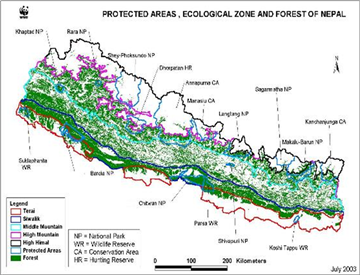 This map shows protected areas, ecological zone and forest of Nepal. The master plan for the forestry sector of 1988 is an overall twenty-five years forest policy that included strategies to manage forest resources in the appropriate way. The master plan was prepared by Ministry of Forest and Soil Conservation. Before the Master Plan for the Forestry Sector (MPFS) in 1988, a provision made in the Forest Act and its bylaws was duly acknowledge in the national plans and programmed in Nepal. The NPC has incorporated policies from the national forestry plan published in 1976 into seventh five-year plan. Objectives of that policy were to meet people’s needs for forest products, including timber, fuel wood, fodder etc. It maintains or restores ecological balance thought afforestation and water shade management, and encourages maximum economic gain from forest products. The corresponding aims of the seventh five-year plan were to supply the needs of daily life such as fuel wood, timber, bedding materials, leaves and grass, as well as to carry out afforestation. Encouraging the maximum participation of the people protected afforested areas. The master Plan was prepared by the combined efforts of the Government and donors, international development agencies. The plan specified two sets of objectives; the long –term objectives and the mid –term objectives. They are as below. Community Forest is defined as a situation, which intimately involves local people in forestry activities  (FAO 1978). Gilmour and Fisher (1991) have defined CF in terms of control and management of forest resources by the rural people who use them especially for domestic purposes and as an integral part of their farming systems. CF started in the late 1970s, when the development strategies of the 1950s and 1960s that focused on industrial development were being criticized for overlooking rural development and not meeting the basic needs of the rural poor. Since then, it has been spreading over the world with different names but similar objectives. Malla (2001) reports some examples like Join Forest Management in India, Social Forestry in Bangladesh, BC Forestry in Canada, Community Forestry in America, Social Forestry in China, Community Forestry in Nepal, and so on. The community forestry program was launched in the late-1970s as part of efforts to curb the widely perceived crisis of the Himalayan forest degradation, when the government of Nepal came to the conclusion that active involvement of the local people in forest management was essential for forest conservation in the country. The term community in its broadest sense may refer to any group of persons united by a “community of interest”. In this sense a professional group, a residential unit, or a club or a voluntary association may all be referred to as communities. A forest is a biological community dominated by trees and other woody vegetation. Thus community forestry activities are aimed at providing direct benefits to rural people and that “the people” should have a substantial role in decision making. At this level that is as a statement about the philosophy behind community forestry, there is nothing wrong with the term . Community forestry is flourishing in Nepal, improving the livelihoods of rural household of communities, and nurturing democracy at the grassroots level despite a prolonged insurgency and political upheavals . During the 1970’s, the recognition of Himalayan degradation as a serious environmental crisis . Increased pressure on international development institutions and donor governments to contribute to the conservation of the Himalayas. This led to a shift in the development discourse away from an emphasis on infrastructure and technology transfer toward environmental issues . Moreover, Nepal’s strategic geopolitical situation (being located between China and India) and fragile environmental condition attracted donors .Whose viewed forestry and the environment as the key elements of integrated conservation and development projects. Several international agencies (Such as NPO, NGO, INGO) assisted the Nepalese Government in formulating the master plan for the forestry sector (MPFS), which recognized the need for local people’s participation in the conservation and management of the country’s forest resources. In 1989, as the master plan for the forestry sector was being finalized and formally adopted by the government, an ongoing movement against the panchayat system by the citizenry also culminated in the reinstatement of multiparty democracy in the country. The decisions of subsequent governments further strengthened the regulatory framework of a community-based forest plan for the forestry sector (MPFS). Community forestry is one of components of social forestry. Agro forestry, Agro-salvo pastoral systems and private planning programs come under the umbrella term of social forestry. , describes the natural and potential role of social forestry. He opines on what ways, and to what extent social forestry can help to alleviate the acute socio-economic problems faceted by many developing countries. In this potential role of social forestry, he mentioned in his paper the ecological aspects like site protection, economic aspects like income and wage and social benefits like a higher quality of life. The emerging of the concept of community forestry in the late 60’s and early 70’s parallels with the wider concert of development with basic community needs. Community forestry initially involved local people in forest activity. Community forestry refers to the control and management of forestry resources by the rural people who are using them especially for domestic purposes and as an integral part of their farming system. Villagers see community forestry or village forestry as the control management and use of forest resources. It seeks to increase the level of awareness of local people and actively involve them in all aspects of forestry activities. .
Community forestry has been defined as “The control protection and management of local forest by local people or community known as a user group.” . Gerald Foley has also an opinion that over the past decade, farm and community forestry has emerged as one of the principal responses to the problems caused by the widespread loss of tree and forest cover in the developing world. Its aim is also help people to solve their own wood supply problems, meet their own needs and preserve the environment in which they live by planting trees on their farms and around villages . Table 2 shows the main features of current community forestry in Nepal. The most signification regulatory development in support of community forestry was the enactment of the forest Act 1993 by the first elected parliament after the 1990 movement for democracy. 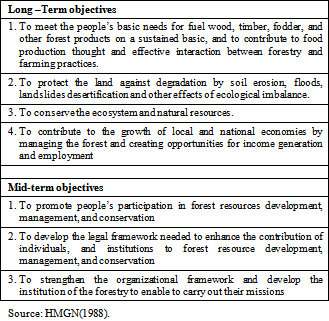 The 1993 Forest Act guaranteed the rights of local people in forest management , as briefly summarized in Table No: 3. Nepal became the world’s first country to enact such radical forest legislation, allowing local communities to take full control of government forest patches under a community forestry program. Meanwhile, international agencies continued to support the process of reorienting government forestry officials the work as facilitators of community based forest management and away from their traditional policing roles . Regarding the forest management, present Forest Act of 1993 entitles the CFUGs “to develop conserve use manage the forest sell and distribute the forest product independently by fixing their process according to operational” (Forest Act 1993). The forest regulation of 1995 introduces a provision that in order to transport forest products, a committee or person designated by the CFUG shall issue a permit and stamp the timber. The transportation products can only take place after informing the concerned forest office and having the matter endorsed by checkpoints located in route. Above data shows process of Community Forest formation. 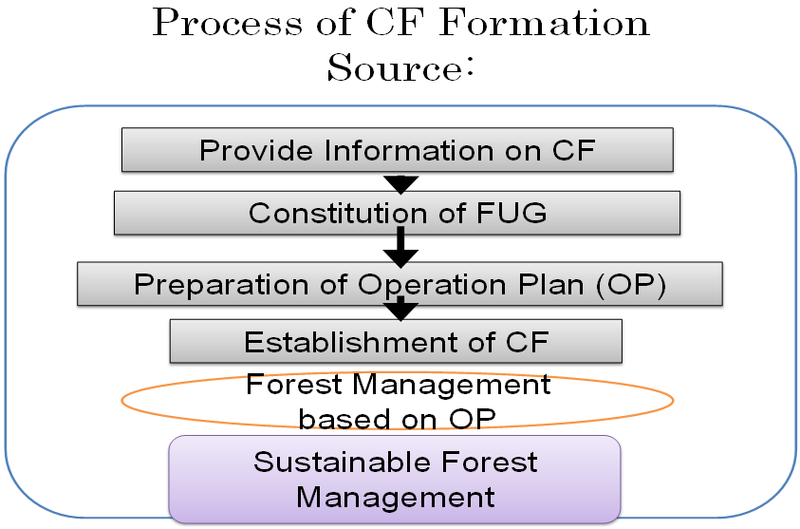 Forest Rules (1995) provide scope for CFUGs to prepare their Operation Plans (OPs). The OPs define forest conditions, management activities and determine the annual allowable cut for timber and fuelwood. 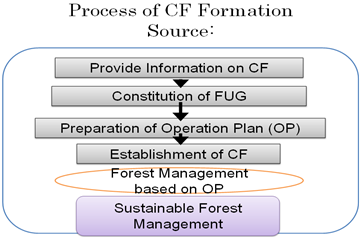 The OPs are prepared in line with the CF Inventory Guidelines (2004).Forest Rules (1995) stipulate that a District Forest Office (DFO) needs to conduct a field verification of the OP before approving and handing over the forest to a CFUG. The DFO can also suggest to amending the OP if they feel it is necessary. Upon approval, they issue a certificate to the CFUG with a bond to the effect that the CFUG will comply with the conditions that are prescribed. 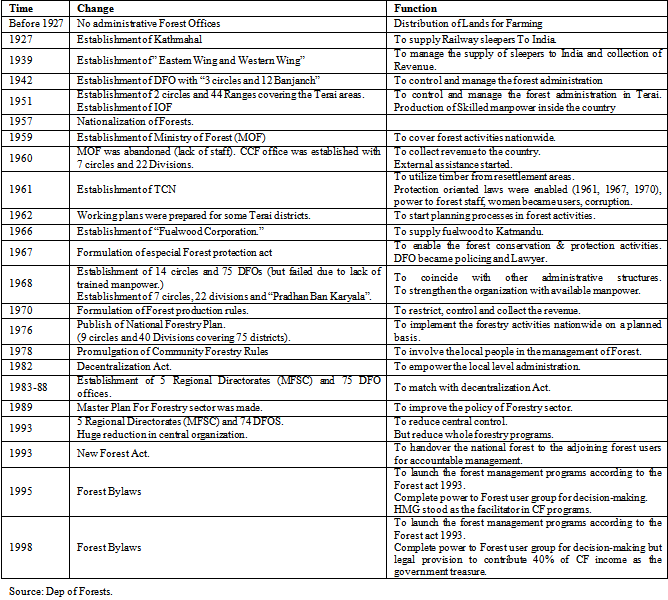 Below table depicts categories of forest, their management objectives and agencies responsible for their management. Among these forest categories, CF has received the highest priority with in the forest sector, because large numbers of people are directly involved in this forest category. • Grazing, the setting of fires and the production of charcoal. • Removal, sale or distribution of forest products, and the extraction of resin, bark, timber, firewood, boulders, rocks sand or soil. • Export of forest products to foreign countries. • Destruction of biodiversity, the hunting of wild-life and the collection of insects and butterflies. Individuals have no rights of any type in government-managed forest except when a rights or facility has been obtained thought a lease or in any other way from the government or from an authority empowered by the government. For the purpose of developing or conserving the forest, the government or an authority empowered by the government may close any private or public path or stream situated with in the national forest (HMG1995). In the event that the leaseholder fails to perform its defined task in accordance with the forest lease, or other-wise undertakes activities that may cause significant adverse environmental effects, the Regional Forest Director may decide to cancel the forest lease and reclaim the forest. The Regional Forest Director has ultimate authority over the lease as stipulated under the MFSC. Upon receipt of an application, the DFO can handover a religious forest to the jurisdiction of a religious body, group or community wishing the manage the forest for its religious value. Before handing over the forest necessary arrangements must be made to ensure the traditional rights of forest user are not adversely affected. The religious body or community may utilize the forest products derived from the religious forest for religious activities and not for commercial purpose. Where any significant environment impact is anticipated, trees may not be removed and any activities which caused soil erosion or damage to public property-particularly in watershed areas- are prohibited. If the group fails to meet any of the terms and conditions defined for the forest’s management, the DFO may reclaim the forest at any time. A component to national forests, protected forests are considered to be of special environment, Scientific or culture importance. The government prepares and implements a work plan for the management of protected forests. No activities other than those defined in the work plan or those granted special prior approval by the government, can be conducted in a protected forest. A community forest is a part of a national forest that has been handed over to a user group for its development, conservation and utilization for the collective interest. The forest Act and its regulation have provided ample opportunity for people to participate in the management of forest of Nepal basically thought the provision of community and leasehold forests. The DFO has the authority to hand over management of community forests to user groups. The DFO is also authorized to provide technical and other assistance required to user groups and mobilize users to prepare that work plan for the management of the community forest. As self-governing institution, FUGs are legally allowed to fix prices of the forest products they sell and to apply silvicultural and other forestry practices in the management of the forest. The new policy has also allowed users to cultivate non-timber forests products as a means of generating income earned on forest based cash crops and to commercialize wood and non-wood products and their processing to fulfill the subsistence needs of local people. In so doing, due consideration must be given to the health and vigor of the forest. Similarly FUGs are free to collect and spend income generated from the community forest not only for the development of their forest but also in order to carry out other social and community development activities. FUGs may independently network and consult with other FUGs and their federation. FUGs have provided a platform for the discussion of all aspects of forest resource management for local people, politicians and government officials. In the event that a FUG fails to perform its function or attempts to carry out any operation not included in the Work plan which may cause adverse environmental effects, the DFO is empowered to cancel the registration of the FUG and rescind the rights to the community forests. The FUG has the status of an autonomous corporate body and has a separate seal of its own. • Amount received from any other source. The FUG is required to submit an annual report of its activities, including descriptions of the condition of the forest and the expenditure and balance of its account, to the DFO. Private forests are forests planted, nurtured or conserved on any private land owned by an individual. The owner of the private forest may develop, conserve or manage the private forest, and utilize or sell and distribute the forest products by fixing prices at will. Any person or institution can register a privately owned forest with the government, and is legible to receive any necessary technical assistance from the state if they do so. People participation as a concept has gain remarkable currency in recent years. This is mainly because of its symbolic power as a glossy cover to make plants, program and project attractive. Besides endorsing people participation is one good way to assert the legitimacy of a program or project today when there is so much talked about in empowering the local people and decentralization. People’s participation has been taken as a means by government agencies and their projects alike for achieving their goals . Participatory management is often seen as an appropriate solution to reduce degradation. It has been thought that granting property rights over the local commons would ensure the equitable and sustainable use of environment resources. When the responsibility of allocating natural resources is delegated to local organizations, communities tend to appropriate forestry programs. So this sort of program is one of the best ways of economic and environment activities through the proper management of local resources of forests . Community participation is aprocess in which people are encouraged realizing that they themselves have the abilities, energies and some of the resources to make initiatives to improve their lives. This approach is being fulfilled through the community forestry project, which requires community participation . The willingness to participate in community forestry clearly varied depending on the nature of the activities (Decision making, forest protection, forest development and forest utilization). In each activity different groups of people were found to be participating at different levels and for different resources . The principle aim of community forestry is to involve people in all stages from decision making to harvesting, so it is the most essential feature of community forestry. Local people are primary managers and users of forest products. Low levels of their participation have created the problem in protection and management of forest products in terms of grass, fodder, fuel wood and leaves. In this way participation involves the production and management of community forestry from very beginning. Some independent variables can be found to minimize women’s participation in the community forestry system. Social and cultural factors highly influence to women’s participation. At the same time, the education level of women and lack of skills are supporting factors to bypass their involvement in the CF system. The conceptual framework of Mobilization of Natural resources development by Yogo (2005) has been used. It consists of three factors: “Resources”, “Institutions “and “Norms”. Natural “Resources” (community forest) are the base of local development and utilization, and an “Institution”, such as CFUG acts as the user of the resources. The CFUG acts as the user of the resources. The CFUG will be based on a “Norm” such as forest Management Rules for the sustainable use of resources. Community forests provide products with value such as timber, fuel, food, as well as an in-direct benefit from the forests as pathways to peripheral populations. Likewise, the community forest policy can make changes in the status of CFUG and “forest management” rules can be adapted at the national level. Overall, these factors supposedly contribute to “poverty reduction”. When the Community forest program was first implemented during the 1990s; the hand-over rate was high. 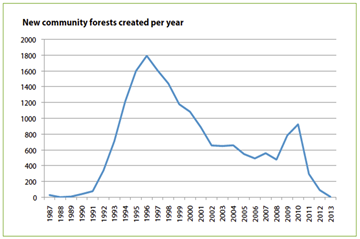 Figure 1 depicts the hand –over of Community Forests from 1991 to 2008. A considerable number of Community forests were handed over to communities between 1994 and 1997, possibly because a new Forest Act was promulgated in 1993 with provisions for more user rights. Nearly 1.5 million people are involved in Community Forests and the figure is increasing day by day since only 20 percent of the total potential Community Forests have been handed over to the 14,439 CFUGs (CFD 2010). The potential Community Forest area is 5.5 million ha and only 1.23 million ha have been handed over to Forest Users' Groups, and these groups comprise 35% of the total population (26million) of the country. The goals and objectives of Community Forestry will vary according to the individual needs and aspirations, whether it is a developed or a developing country. In developing countries, the aim is to meet the basic needs of the communities such as fuel-wood, fodder, grass building materials, medicines, and food. Whereas, the goal of Community Forestry in developed countries is to strengthen community stability including reducing unemployment, by enhancing sustained economic benefits from forestry. Therefore, there are many reasons to increase people’s participation in forests. In the past many governments have failed to manage forests, keeping the forests in state control. The rationale behind the provision of the Community Forestry and the CFUGs in Nepal was a consequence of the government's incapability to conserve the forest and biodiversity effectively through its bureaucratic systems. In 1957, the Government nationalized virtually all forests by placing them under the legal authority of Forest Department. As a result, people gradually lost all of their traditional rights over the forests and were deprived from getting their subsistence needs from forest products. Resentment against nationalization contributed to unregulated extraction, creating conflict between villagers and DOF staff (SPRINGATE et al. 2003). This distancing of people from resources management led to wanton destruction of forests in Nepal . Therefore, Community Forestry began as an attempt by governments and aid agencies to provide an alternative way for forest departments to manage forests, that is, through including local people . Even though the hand over rate of CFs is declining, the accumulated area and the number of CFs have increased substantially from 1991 to 2008. Some figures related to CFs are shown in Table 4. Out of a total area of 5.5 million hectares, 2 million hectares are categorized as potential CFs and the remaining 3.5 million hectares are categorized as leasehold forest and government managed forest. 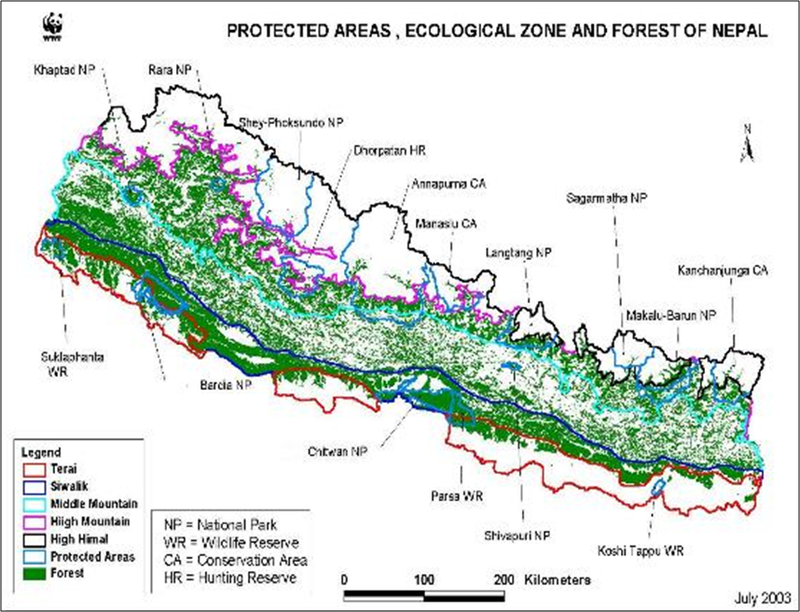 Twenty two percent of Nepal’s forest area has been handed over as CF. Up until 2009, 14,569 forest patches have been handed over to communities. Approximately 1.67 million households, which constitutes about 35% of the total population, are involved in CFM (DoF, 2009). 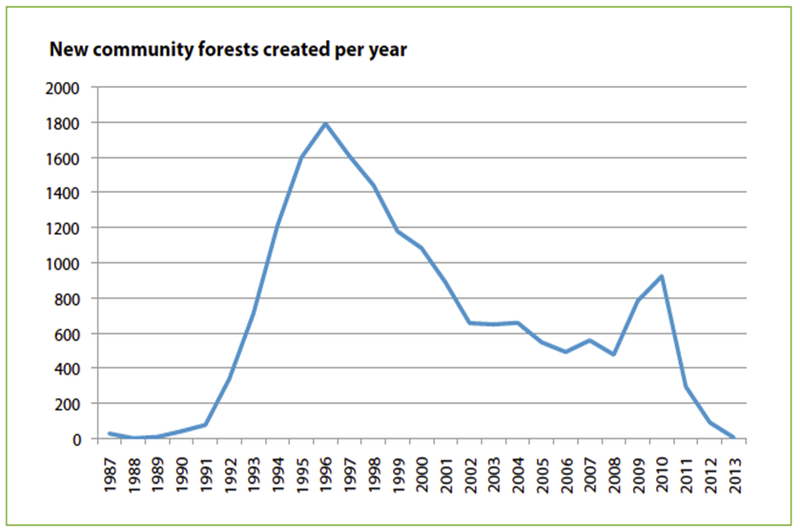 The chart shows that the first community forests were created in 1987, in just a few districts, and rose slowly after the approval of the master plan for the forestry sector in 1989. The forest Act 1993 and the forest Regulations 1995 jump-started the registration, management planning and handover of community forests. The number of community forests in the country increased dramatically between 1991 and 1996, particularly in the easily accessible hill areas. However, due to the ten years of political insurgency that followed, the rate of community forest creation heavily decreased: government staff could not easily move around the rural areas, and the priority of donor partners changed from forestry to peace building. After the success of the second revolution in 2006, the trend seemed to turn upwards again, but was halted by the government of Nepal passing a policy to stop handing over the forests. This policy was reversed in 2010 and met with an increase in community forest creation, but this again was followed by a policy that has made community forest creation more complicated and restricted its budget. Forest resources play a crucial role in rural livelihoods in Nepal and elsewhere in the developing countries . The forest resources directly fulfil forest related subsistence needs of women, poor and backward people as well as commercial needs of well-off people . The recent studies show that the Community Forestry in Nepal has contributed to the improvement of forest condition and people’s livelihoods mainly in two ways: Capital formation in rural communities and policy and governance reform of various organizations and agencies . The Community Forestry is oriented towards the development of natural capital (e.g; Good forest conditions), physical capital (e.g; schools, roads, temple,), financial capital (E.g. ; CFUG fund), human capital (e.g. ; reoriented forestry staff, higher education of forestry staff, capable CFUG member), and social capital 28 (e.g. ; building CFUG as local elected body, and FECOFUN)  These capital or assets produced by Community Forestry are playing a crucial role in rural development and development of livelihood assets. Some previous studies carried out by Forest Action team in 2003 on “Impact of Community Forestry on livelihoods in the Middle Hills of Nepal” described the Community Forestry’s impacts on livelihoods of the local people. They suggested two major types of impacts: Direct Impacts: Change in the levels and security of forest products and benefit flows (through the improvements to the forest resources and/or improved tenure right) Indirect Impacts: An indirect benefit comprises all those benefits that come from the institutional development of the community based forest management system or the institutional system of Community Forestry. These benefits include improved social capital for collective planning and action; support for community infrastructure and development activities; household livelihood/ income generation opportunities (including credit facilities) and finally improved human capital. There is much evidence, which shows that the forest conditions and flow of forest products have improved through Community Forestry . Increased forest product flows are due to improvement of forest conditions (Natural capital), and changed entitlements to use it . Since natural capital is the term used for the natural resource stocks from which resources flow and services useful for livelihoods are derived . Much evidence shows that Community Forestry has contributed to the development of social capital in rural as well as in the urban part of Nepal through the set of social relationships . The CFUGs create a new social forum, with the potential for local-level development planning, improved social support structure and social cohesion . It has been reported that Community Forestry process has increased social cohesion, which has enhanced social capital, of those who have been powerless, left in isolation and excluded from the mainstream of social and political processes. For, example, , reported that the participation of women in the committee has increased from 19% in 1996 to 30% in 2003 in the project area . The CFUGs have created a network through their federation from village level to the district and to the central level: FECOFUN is the observable example of the development of social capital through Community Forestry in Nepal. Similarly, the investments of Community Forestry fund in the village or community level have led to improve village level infrastructure, are the source of physical capital in the grassroots' level . Since the physical capital comprises the basic infrastructure and producer goods needed to support livelihoods. The CFUGs have carried out many community development activities on their own by using group funds or through volunteer work . Construction of village trails, small bridges, community buildings, schools and temples, drinking water supplies, village road construction, village electrification, and trail making are examples of physical capital created through the Community Forestry program in Nepal. The group fund generated from the sale of the forest products, levies and outside grants are the financial capital created through Community Forestry . Substantial amount of funds have been generated from Community Forestry, for example in the year 2002/03, the CFUG from Banke, Bardia, Kailali and Dhading districts generated a total amount of Rs. 30,9000(US$ 412,000) from forest products sale, membership fees and penalties (CARE 2003). Table 2 provides the information on income and expenditure of CFUGs in Nepal. Data shows that the CFUGs of Terai region alone have contributed to 46.5 percent of the total income of the CFUGs, while CFUGs in Middle Hills and High Mountains have contributed 48 29 percent and 6 percent respectively. The amount of income and expenditure presented in the table is an example of financial capital generated from Community Forestry. Also, through the Community Forestry program, a number of training, workshops and exposure visits have been conducted by government and non-government organizations and individuals at the community level, for enhancing knowledge and skills related to forest silviculture, community development, organizational management and leadership development . Report from NSCFP supported districts for Community Forestry show that more than five thousand community members have participated in various workshops, trainings and seminars over a six –year period. Data show that 13 government staff have received a long term scholarship for higher studies; 312 community members (of which 149 are female) have received scholarships for schools and post school education, and a total of 1,184 staff members of government and non-government organizations have received short term training and study tours . These types of activities carried out by governmental and non-governmental organization at the rural level, enhance the capabilities of the people and raise the level of awareness. Many illiterate rural women are becoming literate through this training, which is the human capital generated through Community Forestry. Human Capital refers to both the health and nutritional levels necessary for sustained labor input and the educational standards and skill levels that make labour more productive . According to the Nepalese government social forestry program, activities conducted in community forests are supposed to be concerned with generating economic benefits as well as improving ecological and social conditions as well. Below are ways community forests can be managed to support these processes, as well as what is known regarding why households join a CFMG. Some of the hoped for ecological benefits include the following. Through community forests CFMGs can contribute to the rehabilitation of degraded forests, water sources can be protected, fire incidence can be reduced, wildlife can be protected, forest cover can be improved, and the CF area can be recreational area for outsiders to visit. However, there is limited empirical documentation on actual practices and ecological impacts, especially over time. The literature suggests there is great potential for community forests to enhance cooperation among the members of CFMGs and build local governance capacity. Especially in rural areas in Nepal they always have cooperation as part of every program like marriage parties and other occasions where they always help each other. A sense of ownership over the forest can be increased thereby protecting the CF against outsiders illegally taking resources. There is also potential for rural residents to have a formal way to express their concerns and priorities by participating in CFMG meetings. In the history of forest management, before the start community forestry activities in the early 1980s there were little tradition of national forest management in the middle hills. Even in the Tarai, the term Forest Management meant mainly the harvesting of trees and was only concerned with afforestation on clear felled areas. Government forest management was synonymous with forest protection and establishment of plantation. During early 1990s priority for community forestry shifted and focused on the handover of nature forest. Existing studies suggest there are many opportunities for CFMGs member to increase their livelihood from community forests, as well as contribute to environmental sustainability. These include strong political support from the government, enabling regulatory frameworks, growing capacity within the Nepal government and the forest-related development sector, and some beginning experiments with timber and non-wood forest product income generation in community forests. Community forestry as a strategy to enable the utilization of forest resources in a sustainable way arose during the 1970s. the development strategies of the 1950s and 1960s focused on industrial development, which were being criticizes for overlooking rural development, and not on acting the basic needs of the rural poor. FAO (1978). Forestry for Local Community Development Food and Agriculture Organization of the United Nation (FAO), FAO Forestry paper, No 7, Rome. Ministry of Forest Nepal http://www.mfsc.gov.np/. Pandit R and Bevilacqua E 2011 Forest users and environmental impacts of community forestry in the hills of Nepal Forest Policy Econ. 13 345-52. Gautam R., Hsu, N. C., Lau, K.-M., Tsay, S.-C., and Kafatos, M.: Enhanced pre-monsoon warming over the Himalayan-Gangetic region from 1979 to 2007, Geophys. Res. Lett., 36, L07704, 2009b. Manandhar, N.P., (2002): Plants and People of Nepal. Timbre Press, Oregon, USA. 599p. Gauli, K. and Hauser, M. (2009). Pro-poor commercial management of non-timber forest products in Nepal’s Community Forest User Groups: Factors and success. Mountain Research and Development, Vol 29 (4): 298-307. Bista S, Webb EL. 2006. Collection and marketing of non-timber forest products in the Far Western Hills of Nepal. Environmental Conservation 33(3):244-255. Dev, O.P., N.P. Yadav, O. Springate-Baginski and J. Soussan (2003). Impacts of Community Forestry on Livelihoods in the Middle Hills of Nepal. J. For. Liveli.3: 64-77. Kandel, B.R., Kanel, K.R., 2006. Challenges and achievement of community forestry. In: Shrestha, R., Kandel, B.R., Devkota, B. (eds.) Hamro ban in Nepali. Department of Forests, Kathmandu. Kanel, K.R. and Niraula, D.R. 2004. Can rural livelihood be improved in Nepal through Community Forestry? Banko Jankari. 14(1): 19-26. Bajracharya, D. 1983. Deforestation in the Food/Fuel Context: Historical and Political Perspectives from Nepal. Mountain Research and Development, 3(3): 227-240. Mahat TBS, DM Griffin and KR Shepherd. 1986. Human impact on some forests of the middle hills of Nepal, Part 1: Forestry in the context of the traditional resources of the state. Mount Res Dev 6(3): 223-32 Misra R. 1968. Ecology workbook. New Delhi: Oxford and IBH P.
 1978c. Preliminary Notes on the Nature of the Gorkhali State and Administration. Regmi Research Series 10(11): 171-174. Chemjong, I. S. 1967. History and Culture of the Kirat People, Vol. 1 and 2, Phidim: Tumeng Hang. Stiller, L. (1973). The Rise of the House of Gorkha: A Study in the Unification of Nepal 1768-1816, Ratna Pustak Bhandar, Kathmandu. Rhodes, R.A.W. (1997). Understanding Governance, Buckingham: Open University Press. Gilmour, D.A and R.J Fisher 1998. Evolution in Community Forestry: Contesting Forest Resources, RECOFTC, Bangkok, Thailand. Ojha, H., and B. Pokharel. 2005. Democratic innovations in community forestry‐What can politicians learn? Participation 7(7): 22-25. ECKHOLM, LOSING GROUND: ENVIRONMENTAL STRESS AND WORLD FOOD PROSPECTS 187 (1976). Cameron, J. 1998. Development thought and discourse analysis: A case study of Nepal. In New perspectives on India-Nepal relations, ed. K. Bahadur and M. L. Lama. New Delhi: Har-Anand Publications. Metz, j.j.1995. Development in Nepal: Investment in the statusquo. Vergara, Napoleon T. and Rodolfo A Fernandez. 1989. Social forestry in Asia: factors that influence program implementation. Los Banos: Regional Center for Graduate Study and Research in Agriculture (SEARCA). Gronow, J, and Sbrestba, N K, (1988). Man& for a Reorientation Workshop on Community Foresn-y, Koshi Hills Community Forestry Project, Dhankuta. MFSC +33,. Draft proposal of the Tenth Plan. Ministry of Forests and Soil Conservation, Kathmandu, Nepal. Chhetri, B.B.K., 2005. Community Forestry Programmes in the Hills of Nepal: Determinants of Users Participation and Household Dependency, M.Sc. Thesis, Norwegian University of Life Science (UMB). Adhikari, B., S. DiFalco, and J. C. Lovett. 2004. Household characteristics andforest dependency: Evidence from common property forest management in Nepal. Ecological Economics 48: 245-257. Upreti, B.R. 2000. Social transformation through Community Forestry:Experiences and Lessons from Nepal. Mountain Forum On-line Library Document, http://www.mtnforum.org/resources/library/upreb00a2.htm. Pokharel, B. K., Nurse, M. and Paudel, D. (in preparation). Are We Achieving FUGs' Sustainability? Analysis of Institutional, Economic and Ecological Sustainability of Forest User Groups in the three districts of Nepal. NSCFP Discussion Paper. Nepal Swiss Community Forestry Project, Kathmandu, Nepal. Acharya KP (2004). Does Community Forests Management supports biodiversity conservation? Evidences from two community forests from the mid hills of Nepal. J. For. Livelihood 4: 44-54. NSCFP. 2003b. Forest Based Enterprises and Trade Status in Ramechhap District. Kathmandu: NSCFP.